During the months before we left the United States we tried to contact schools with regard to this "Pen Pal" project. We did a presentation at Seton Catholic High School in Richmond and teachers and students showed interest. We also talked to Marcy Roberts at the Richmond Friends School, and two teachers at Richmond High School. In the latter case, however, we only were able to talk informally and by now the teachers have probably would need to be reminded of it. We also made brief contact with teachers at Whitefish High School before we left Montana, but we were very busy and should have laid down a firmer foundation. Here in Ibillin, we have been reasonably successful in getting students interested, especially those in the higher classes in the elementary school. These students are just starting on English, and we don't carry on very long conversations ("What is your name?" is a very popular phrase). However, they do write very well and know how to use a computer. We now have sent off ten letters and are waiting for answers from students at the Richmond Friends School. 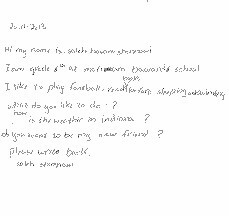 Here are some pictures of the students in the library where they have been writing letters, and here is also an example of one of the hand-written letters. I think you will be impressed with how well they write, considering that the languages they know contain no similar letters, and proceed in the opposite direction. At the high school we are in the opposite situation. We contacted Seton High again, and very quickly received 19 short letters from 10th grade students. These were in a "packet" from an English teacher, and the only email address we have is hers. We did a little negotiating and agreed that students here at Mar Elias could send messages to her from their email accounts and she would parcel them out to the proper students in her class. So, we printed all those messages and included instructions on each one as to how to send the message in return. We gave those messages to the head of the Engllish department here, and so the process should proceed - mumkin. (mumkin is a very useful word. It means something in between "I don't know" and "perhaps".) In the meantime another English teacher here has given us a list of around 20 9th graders who want to make contact with American students of the same age. The difficulty with trying to promote this kind of exchange is that teachers (especially here at Mar Elias) have a set schedule, aimed at preparing the National tests which they take at the end of each year. The program involves the usual testable items like reading comprehension, vocabulary, grammar, etc., and email exchanges, though helpful, are low on the list. the same is probably true for American high school teachers as well. If you are connected to a group of students, roughly ages 12 - 18, (it could be sons and daughters, a church youth group, boy or girl scouts, school club, etc.) who would like to make contact with a student here at Mar Elias, please have them send their email address to us, and we will facilitate the contact OR ask for an email address of a student here, and we will send that directly. Our email address is samn@earlham.edu . 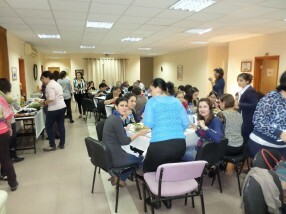 On Thursday the guest house was the venue for a dinner for the teachers and staff of the elementary school. Badiya spent most of two days preparing, and we helped when we could. 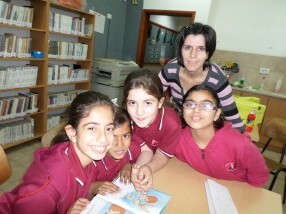 The event took place at 3 pm, and Badiya was helped by a couple of the staff from the school. Abuna Chacour made another appearance, having just returned from Belgium. He spoke to the teachers - his speech seemed to be inspirational with a good bit of humor. We did the best we could to be helpful, but the team of Badiya and her two helpers was very efficient from start to end, and we only contributed to the clean up. It is an event that goes down on the calendar, but without much additional information. A day later on Friday another group arrived, a worship group from the far north of Galilee who were here for a religious retreat. This group is from the same movement as the group that appeared unexpectedly two weeks ago. (They are part of the Neo-Catechumenal Way, or NCW. In Galilee the center of activity is at the Domum at the top of the Mount of the Beatitudes on Lake Tiberias). 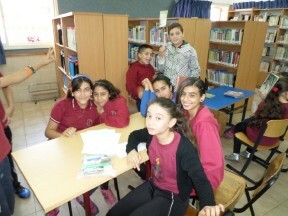 This group is a small, closely knit and mutually supportive community, from Fasuta, near Lebanon. One of the members explained that they felt that there was no real substance to the services in their Melkite Church - just a priest going through motions with the congregation responding. This movement seems to involve a return to the scriptures, careful studies of the Bible, and an effort to dedicate one's life to Jesus and live accordingly. I am not sure exactly what that last statement means, since the gospels are pretty radical when read closely, and "living accordingly" could be dangerous here in Israel. "If you want to be in God's family, go out and do some peacemaking". Father Chacour has done a lot of that in his life, as have Christian Peacemaking Teams and others like them. Once again, Badiya, Elias and group members seemed to take on most of the tasks. Our only contribution seemed to be cleaning the tables and "volunteering" to help with the children - see picture above. When they left, however, the real work began that involved stripping the beds, washing the sheets, and preparing the rooms for the next group. Since everything seemed mostly out of our hands with this group, we spent some extra time with students. On Friday, that strange no-school day when about half the students are here, we commisioned ourselves to teach a few sixth-grade girls some folk dances. They were in some kind of gifted program, but had free time before and after their classes. Music is a problem. I somehow wiped out the copy I had of a flash drive containing 4 GB of dance music. Luckily I still have a few on the hard drive, and there are internet sources for many more. That's only half of it. Some kind of PA system is really necessary, since there are always other sources of sound surrounding exhuberant dancers. Our first group of dancers were pretty capable sixth graders - one of whom we had met at the music school. Ruth taught them Salty Dog Rag right away, but it took most of the day to get the Red Foley version on the computer and amplified at least a little bit. Later in the day we had them, along with some younger boys and girls for about an hour and a half, which was way too long. We went through the usual start-off group of dances, including Seven Jumps, Ersko Kolo, the non-couple, non-Polka form of Doubleska Polka, and finished with Gustav's Skoal. We had speakers on my little lap top, and that was ok but not really enough. We also threw in some demonstrations to fill the time. There were some hitches - the boys tried to kick the opposite girls when the circle went in and out (Ersko), and there were some fake punches thrown to the sound of Skoal - but we were pretty successful. If I can find some kind of PA during this week things will be better. One of the boys had the class vote on which dance they liked best, and Gustav won, with Seven Jumps a distant second. Just stay on the topic of dancing - yesterday we dropped by the famous gym (the one that involved James Baker) and encountered a woman gym teacher with a class of high school girls. We told her we danced, and we did a little Hambo. She seemed to think that we were a good example of elderly people who have stayed active, and she asked us to come to her class and teach some dancing next week. We are looking forward to it, but we may be facing the same problem of finding some kind of PA system. It is interesting that with some prodding the smaller boys will dance, but we will only have girls in the high school class. Every week has to have at least one surprise. This one occurred as we were leaving the gymnasium. Bishara, one of the maitenence - security workers spproached us with an intercom. On the other end was Elias O, asking us for the key to the church. That's the large Church of the Beatitudes. It seemed odd to us that we had the only key and that the security men would need us to open the door. Ruth ran off to get the key, and I decided just to go home and get some desk work done. 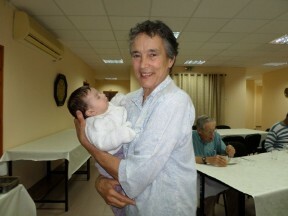 Ruth got to the church to find a large group of Jewish visitors waiting to be shown the church. Now that is unusual. 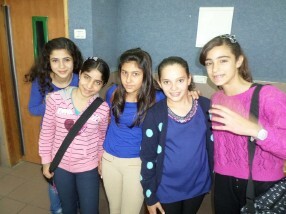 I have wondered how many Israeli Jews I would meet in Ibillin, and so far it is one. Ruth at this instance moved her total up to about thirty. This group was on a tour of the Arab part of Galilee, and had already spent time on the streets of Shefar'am and Ibillin. The visitors did not seem to know much about the schools or about Elias Chacour, but the guide was very knowledgeable. Ruth did her best as a hostess, finding bathrooms and turning on the lights. She also exchanged phone numbers and emails with a couple who may show us something of Southern Israel in the future. My surprise and consternation regarding this event comes from the low priority it seems to have been given. In working with Pilgrims of Ibillin, and conversing with Harvey Price and Peter Abrams, we have become aware that there are many people and organizations searching for projects that will bring people together in Israel. Abuna Chacour always finishes his talks on this note. Here was an unsolicited opportunity, but somehow it was lost. 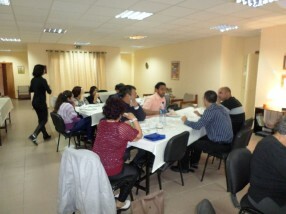 It was organized by Micha Chacour, who now works in the Archbishopric in Haifa. He has been intimately involved in the development of the schools, and still has an office here. Unfortunately Micha has not been well, and could not be on campus to meet this group. The information was sent on to Elias O who just took care of the mechanics, we were not notified, and as a result the visitors saw the church but saw nothing of the school, and had no opportunity to learn its history or purchase Abuna's books. They came and went between class breaks, so they did not even see any students. It seems like a wasted opportunity to me.